For the second time in three days, I deliberately went to a show knowing nothing about it in advance, and I would evidently seem to have used up much of my theatrical karma as for the second time, I was subjected to farce! But ever the contrarian, musical comedy Lend Me A Tenor hit the spot for me with a highly entertaining production where Rumours at the Hen + Chickens did not (although they are completely different beasts in the end). A relatively new musical, written by Peter Sham and Brad Carroll and based on the 1986 play of the same name by Ken Ludwig, the show had a short run in Plymouth last autumn and transfers now to the Gielgud in the West End where it is now previewing following the untimely departure of The Umbrellas of Cherbourg. Several of the cast members have made the move with the show but in a neat twist of continuity, Joanna Riding has joined the ensemble here meaning she will continue to perform in the same theatre. Set in 1934, the Cleveland, Ohio Grand Opera Company is struggling to survive and manager Henry Saunders is banking everything on their new production of Otello featuring leading Italian opera star and notorious womaniser Tito Minelli. But when a set of circumstances conspire to leave Tito unable to perform, shy assistant Max – who harbours his own dreams of performing – has to find a last minute replacement to play the title role. Things are not quite so simple though, this is a farce after all, as there’s a jealous Italian wife, conniving co-stars, a trio of ex-wives, a randy daughter, three version of the same costume, oh, and the President is coming to watch. And it is all really rather good fun. It is a played as a period piece but Brad Carroll’s score borrows liberally from a wide range of influences to pleasingly tuneful and comedic effect. So we get proper old-school Broadway songs complete with delightful choreography from Randy Skinner, Lloyd-Webber-esque balladry with a stunning male duet and plenty of nods to the operatic canon with a delightful song that whips through a huge number of operas in a short space of time. Director Ian Talbot also draws on a broad canvas, working in silent movie and foreign language film gags and milking the opera scenes for all they are worth too, before tumbling headlong into the out-and-out farce of the second act as the mistaken identity plot slides into top gear. This broad array of stylistic influences necessitates a cast with a vast range of experience and expertise and in some respect, this is both the show’s main strength and its weakness. Joanna Riding’s passionate wife is fabulous but something of a cameo role: her Act I songs, the duet ‘Facciamo L’Amor’ and then ‘The Last Time’ are two of the show’s highlights but then she’s off for most the rest of the show; conversely Sophie-Louise Dann’s scheming soprano, whose ‘May Have I A Moment’ is a real tour-de-force, emerges as a major character but only in the second act; Cassidy Janson’s Maggie is likewise stunning but not given enough opportunity to shine. For a show that ends up with six main characters, there is a surprising dearth of songs in the second act to really give this musical the swing it needs to reach the final act. I also think it is a shame that the rather uninspired title song is the one chosen to be reprised at the end when there’s livelier songs. But what is perhaps lost on the musical side, is recompensed with some brilliant comedy with countless absurd touches including a rather non-pc sight gag which is still making me chuckle today. Matthew Kelly, Michael Matus and Damian Humbley are particularly strong here, showing some incredibly well-executed timing (especially for a preview). Humbley’s vocal performance as the backroom guy turned opera star is excellently done too, though Matus’ bombastic Signor Morelli probably edged it for me with the guys. Peter Sham’s book is mostly strong throughout, though a fair few jokes flew by unremarked, not all of which can be ascribed to the preview period. Looking back, the show it puts me most in mind of is probably The Drowsy Chaperone. 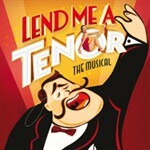 Lend Me A Tenor doesn’t wear its postmodernist tendencies quite so obviously and makes more of a virtue of its old-fashioned sense of humour. And as with so many absurd comedies of this nature, one has to be willing to enter into the suspension of disbelief that allows some of the more ridiculous moments to pass by unchallenged, to pick holes in this is to miss the point completely. I do hope though that this doesn’t suffer the same fate as The Drowsy Chaperone of not being able to connect with a wider audience, the Gielgud’s position on Shaftesbury Avenue should help somewhat as should the word of mouth to raise awareness about the show itself which had been previously a little under the radar. For Lend Me A Tenor does have a lot going for it, not least Paul Farnsworth’s set design which has to rank as amongst one of the most elegant and impressive in London at the moment (it has allegedly used up all the gold leaf in the country!) and a wonderful cast who all seize their moments to shine in a varied and interesting musical which has to be seen just so you can hear how funny the quote as the top of the review is when spoken out loud in an Italian accent (honest). If nothing else, how could you resist this rarest of beasts, a farce that actually made me laugh!